Take with food or fasting? What is the “right” dose of moxidectin? In 2016 there was a preclinical study on treating scabies. Pigs were chosen for test subjects “To provide proof of concept, we utilized an experimental scabies pig model that closely resembles the human route of scabies infection.” It has been tested in humans and “is registered worldwide as a veterinary antiparasitic agent for use in companion and farm animals.” So please be aware moxidectin has not been approved for use in humans to treat scabies. Both moxidectin and ivermectin have been approved by the FDA in humans but only for treating a disease called river blindness. When used to treat scabies, it is called an “off label” treatment. Moxidectin is now in clinical trials for treating that same disease. “Results of recent phase II, and III human clinical trials demonstrated that MOX [moxidectin] is likely more effective than IVM [ivermectin] at controlling onchocerciasis [river blindness], and has the potential to advance efforts to eliminate this disease. “ So it is possible one fine day moxidectin will be available for prescription use for scabies. A single dose of moxidectin cures scabies better than two doses of ivermectin (a week apart). Moxidectin stays in the body 9 times longer than ivermectin. Look at the graph I made (below) and you can see why the moxidectin is more effective. The red line shows that 5 days after taking ivermectin almost all of the ivermectin is gone from the body. That’s why one takes ivermectin once or twice a week for several weeks. But look at the blue line. It shows that the moxidectin takes months to exit the body. A scabies mite has a life cycle of around 14 days. That means after an egg hatches it crawls to the skin’s surface, and then hangs on with pincers for 10 to 14 days to mature. Then it mates, burrows under your skin and starts laying new eggs. The adult mites can live for around 1 or 2 months. So even though repeated weekly doses of ivermectin can kill scabies mites, moxidectin persists for the entire life cycle of the mites and beyond. Neither ivermectin nor moxidectin kill scabies eggs. But because moxidectin hangs around longer it is more effective in killing the mites after they hatch. Be aware moxidectin and ivermectin have been approved by the FDA in humans but only for treating a disease called river blindness. In other words, I am NOT telling anyone to take this. Do your own research, and make up your own mind what you are going to do or not do. Because moxidectin stays in the body a long time it means one dose of moxidectin is enough to treat scabies. 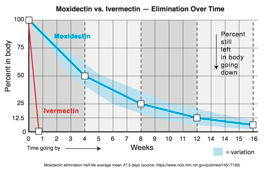 With ivermectin one takes one or two doses a week, but not with moxidectin! Here’s an example. If a person took some moxidectin today, a month from now there would still be 50% of the moxidectin in their body. If they took another full dose that day, they would have 150% of the recommended dose in their body. That’s too much! If they took a half a dose a month after the first dose, then there would be 100% of the recommended dose in their body. But there is no need to take a second dose. One dose is enough. Combine the oral moxidectin with a topical (skin surface) treatment and it’s a one-two punch to really knock out scabies. DO NOT take both ivermectin and moxidectin at the same time. After taking taking ivermectin it takes about a week for it to exit the body, then one could use moxidectin. But if you have taken moxidectin, DO NOT take ivermectin for about three months. Take with food or when fasting? It doesn’t matter. It turned out there was no difference in how much total moxidectin was concentrated in one’s body regardless of whether one took it with food or not. So relax. You can even mix it with a little applesauce or strawberry jam to make it more palatable. In a clinical study humans were given doses of moxidectin from 3 mg to 36 mg, up to ~0.6 mg/kg. They found moxidectin “was generally safe and well tolerated”. Side effects increased as the dose was raised, so there is no sense in going crazy and using a higher dose. So it appears, with a real minimum of information, that a human effective dose would be between 0.15 and 0.6 mg per kg or approximately 0.1 to 0.3 mg per pound. That is within the dosing range tested in the clinical trial. Above: You turn the ring to measure a dose of moxidectin. The numbers indicate body weight. ﻿1. ﻿Hold ﻿the ﻿tube ﻿with ﻿the ﻿capped ﻿end ﻿pointing ﻿to ﻿the ﻿left ﻿and ﻿so ﻿that ﻿you ﻿can ﻿see ﻿the ﻿weight ﻿measurements ﻿and ﻿tick ﻿marks ﻿(small ﻿black ﻿lines). ﻿Each ﻿weight ﻿number ﻿is ﻿for ﻿250 ﻿lbs ﻿of ﻿body ﻿weight…obviously ﻿for ﻿large ﻿bodies ﻿such ﻿as ﻿horses! ﻿Turn ﻿the ﻿plunger ﻿and ﻿below ﻿you’ll ﻿see ﻿tick ﻿marks. ﻿Each ﻿one ﻿is ﻿for ﻿to ﻿50 ﻿lb ﻿of ﻿body ﻿weight ﻿(at ﻿0.4 ﻿mg/ ﻿kg ﻿or ﻿approximately ﻿0.2 ﻿mg/lb). ﻿2. ﻿Turn ﻿the ﻿dial ﻿ring ﻿until ﻿the ﻿left ﻿side ﻿of ﻿the ﻿ring ﻿lines ﻿up ﻿with ﻿the ﻿weight ﻿of ﻿the ﻿animal. ﻿3. ﻿Press ﻿the ﻿plunger ﻿to ﻿squirt ﻿the ﻿gel ﻿out ﻿into ﻿an ﻿animal’s ﻿mouth ﻿(or ﻿onto ﻿a ﻿spoon). 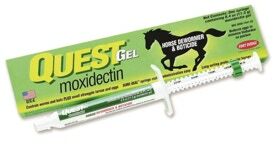 ﻿A ﻿syringe ﻿of ﻿2% ﻿moxidectin ﻿contains ﻿enough ﻿to ﻿treat ﻿an ﻿1150 ﻿pound ﻿horse. ﻿It ﻿has ﻿a ﻿measuring ﻿device ﻿built ﻿into ﻿the ﻿syringe’s ﻿plunger ﻿(see ﻿my ﻿video ﻿on ﻿how ﻿to ﻿measure ﻿a ﻿dose ﻿— ﻿COMING ﻿SOON). ﻿The ﻿Quest ﻿dispensing ﻿system ﻿is ﻿intended ﻿for ﻿large ﻿animals ﻿and ﻿can ﻿make ﻿it ﻿hard ﻿to ﻿measure ﻿out ﻿small ﻿amounts ﻿for ﻿a ﻿smaller ﻿dose. ﻿The ﻿simplest ﻿way ﻿to ﻿measure ﻿a ﻿small ﻿dose ﻿is ﻿to ﻿measure ﻿out ﻿a ﻿DOUBLE ﻿dose ﻿using ﻿the ﻿numbers ﻿on ﻿the ﻿syringe’s ﻿plunger ﻿and ﻿then ﻿squirt ﻿that ﻿amount ﻿onto ﻿a ﻿plate. ﻿For ﻿instance, ﻿for ﻿a ﻿125 ﻿pound ﻿dose, ﻿set ﻿the ﻿ring ﻿at ﻿the ﻿250 ﻿mark. ﻿Then ﻿divide ﻿that ﻿into ﻿two ﻿piles ﻿using ﻿a ﻿credit ﻿card ﻿or ﻿razor ﻿blade. ﻿Use ﻿one ﻿pile ﻿as ﻿a ﻿dose ﻿and ﻿throw ﻿away ﻿the ﻿other ﻿pile. ﻿TIP: ﻿To ﻿make ﻿it ﻿easier ﻿to ﻿see ﻿what ﻿I’m ﻿doing ﻿I ﻿just ﻿add ﻿some ﻿applesauce, ﻿strawberry ﻿jam ﻿or ﻿some ﻿other ﻿food ﻿to ﻿make ﻿a ﻿bigger ﻿pile ﻿which ﻿is ﻿easier ﻿to ﻿divide ﻿in ﻿two. ﻿Another ﻿method ﻿is ﻿to ﻿squirt ﻿the ﻿paste ﻿into ﻿a ﻿disposable ﻿3cc ﻿(3ml) ﻿syringe ﻿and ﻿then ﻿use ﻿the ﻿syringe’s ﻿markings ﻿to ﻿measure ﻿a ﻿dose. ﻿Each ﻿gram ﻿or ﻿ml ﻿of ﻿paste ﻿is ﻿a ﻿dose ﻿for ﻿101 ﻿lbs, ﻿so ﻿it’s ﻿approximately ﻿0.1 ﻿ml ﻿per ﻿10 ﻿pounds ﻿of ﻿body ﻿weight. ﻿For ﻿example, ﻿for ﻿130 ﻿lbs, ﻿the ﻿dose ﻿would ﻿be ﻿1.3 ﻿ml.. ﻿For ﻿250 ﻿lbs, ﻿the ﻿dose ﻿would ﻿be ﻿2.5 ﻿ml. 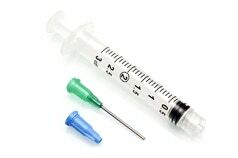 ﻿If ﻿you ﻿have ﻿a ﻿sensitive ﻿enough ﻿scale, ﻿you ﻿could ﻿weight ﻿a ﻿dose, ﻿but ﻿not ﻿many ﻿folks ﻿have ﻿that ﻿sort ﻿of ﻿a ﻿scale, ﻿and ﻿disposable ﻿syringes ﻿with ﻿blunt ﻿tips ﻿can ﻿be ﻿very ﻿cheap. ﻿In ﻿the ﻿Quest ﻿Gel ﻿(moxidectin) ﻿instructions ﻿it ﻿says ﻿it ﻿is ﻿2% ﻿moxidectin. ﻿It ﻿also ﻿says ﻿the ﻿measurements ﻿on ﻿the ﻿plunger ﻿“enables ﻿the ﻿administration ﻿of ﻿the ﻿recommended ﻿dose ﻿level ﻿of ﻿0.4 ﻿mg ﻿moxidectin/kg ﻿body ﻿weight…”.